Involves bending and stretching through a series of simple yoga moves and also embraces elements of Tai Chi and Pilates. Breathing control is a part of all the exercises. You’ll strengthen your entire body and leave the class feeling calm and centred! All standards and ages are catered for and options are offered to suit individuals’ levels. 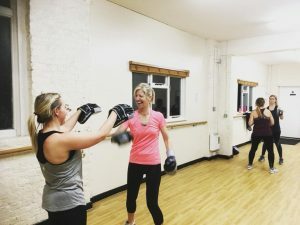 A fun, action packed, non contact class based on the fitness principals of boxing. This interval style training class combines boxing with cardio exercises to help you work all body parts and increase your overall fitness. This class is a great stress buster and all equipment is provided! Suitable for all levels of fitness! So come get involved! 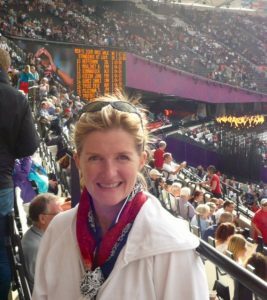 An energetic, upbeat dance class designed to achieve real, measurable, fitness results. 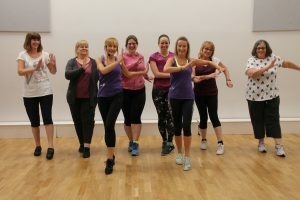 The dance workout mixes the graceful steps of Ballroom and the up-tempo steps of Latin dances to create fun-filled classes where you don’t even realise you’re getting fit Transform your body and have fun dancing to music that will get your heart pumping! All standards and a wide age range are welcome. A fusion that takes the best of Yoga and Pilates. It will provide functional fitness to maintain strength, flexibility, muscle tone, a strong core and healthy pain free back. Suitable for all levels. Dynamic and exciting exercise to Latin and International music / dance themes – based on the principle that a workout should be fun and easy to do. The routines feature aerobic/fitness interval training (aids fat-burning!) with a combination of fast and slow rhythms that tone and sculpt the body. 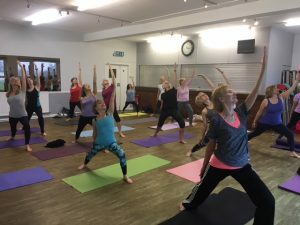 Alice’s classes incorporate legs, bums and tums. Suitable for all levels.